Novi Pazar – Considering the fact that the process of EU accession is crucial for the future of the Bosniak people in the Republic of Serbia, the Bosniak National Council as the highest representative body of the Bosniaks in the Republic of Serbia took part in the Working Group for drafting the Action Plan for the realization of the rights of national minorities in the Republic Serbia, as an integral part in the negotiation process for Chapter 23. Based on the previous work of the Working Group, it is obvious, however, that representatives of the state bodies in this working group ignore all the problems of Bosniaks, without commenting them, do not allow that these problems be debated, ignore any proposal from Bosniak representatives to address these problems and, even, this is not even recorded, which, in our profound conviction, does not fulfill the purpose and meaning of creation of the document itself. Accordingly, we believe that the continued participation of Bosniak representatives in the Working Group for drafting the Action Plan for the realization of the rights of national minorities in the Republic of Serbia makes no sense, given that we do not want to, in this way give legitimacy to the Action Plan for the minority which does not respect the problems of Bosniaks and which ignores any proposal Bosniak representatives give to addressing them. Vice President of the Council – Muhedin Fijuljanin at today’s session of the Working Group for drafting the Action Plan for minorities informed the working group that the representatives of the Council due to the reasons mentioned above will not take part in its future work, and that the proposal of the action plan is illegitimate for the Bosniak National Council. 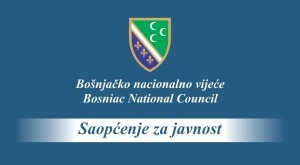 Vice president Fijuljanin announced that the Bosniak National Council will prepare a separate Action Plan for the Bosniaks and Sandzak within chapters 23 and 24 and that representatives of the European Union and national and international public will be introduced with the content of these action plans.